On Aug. 22, 1950, Althea Gibson became the first black person to play at the U.S. Nationals tennis tournament. She came into the competition standing 5-foot-11, with a quick first step, strong right-hand serve and the ability to cover the court in a way others didn’t do as consistently. Going into the contest, Gibson had already proven herself in the national black women’s tennis championship — winning the event twice and making the 23-year-old confident that she would gain admittance into the 1950 U.S. Nationals. But it took support from four-time U.S. Nationals champion Alice Marble for Gibson to receive an invite. In her debut, Gibson made light work of Barbara Knapp, defeating her in straight sets. Gibson’s second-round match offered much more of a challenge and excitement, after she recovered from a pitiful 6-1 opening-set loss. She dropped the first set to Louise Brough, who had won the last three Wimbledons. Gibson topped her in the second set, 6-3, and was leading, 7-6, in the final set. The match was put on hold because of a thunderstorm, and when it picked up the next day, Gibson lost three consecutive games, losing the match. America’s Althea Gibson in play against Shirley Fry on the center court at Wimbledon, London, during the 1956 women’s quarterfinals. Two years later, Gibson was the ninth-ranked tennis player, and in 1956, she became the first black person to win the French championships. The following year, she won Wimbledon and the U.S. Nationals, becoming the first black person to win either tournament. In 1957, the Associated Press made her the first black woman voted as its Female Athlete of the Year. She defended both the U.S. Nationals and Wimbledon titles the following year and also repeated as the AP Female Athlete of the Year. In total, Gibson finished with 11 Grand Slam events and six doubles titles. She holds a 53-9 — 16-1 at Wimbledon, 27-7 at the U.S., 6-0 at the French and 4-1 at the Australian — in Grand Slam events. All of this on the way to inductions into the International Tennis Hall of Fame (1971) and the International Women’s Sports Hall of Fame (1980). 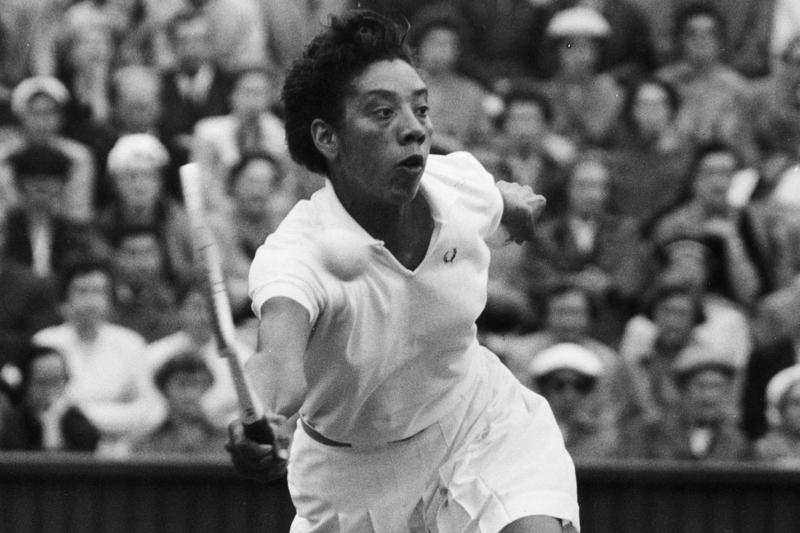 While she experienced a tremendous amount of success on the circuit, Gibson dealt with animosity similar to baseball great Jackie Robinson, who broke the color barrier in baseball. Gibson was not allowed to stay at hotels or even get a reservation for a luncheon held in her honor. She also said she felt the weight of representing black Americans in a sport that lacked diversity.